Online mentoring, also known as Internet mentoring or e-mentoring, is an emerging technology which improves the education, communication, and coaching of women professionals, particularly women entrepreneurs, who may not be able to avail themselves of traditional modes of mentoring. However, like other new technology, online mentoring programs can be expensive to develop and implement. 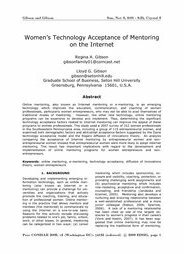 Thus, determining the significant technology acceptance factors related to Internet mentoring can improve the appeal of these programs to women professionals. This study used a 2007 survey of 312 women professionals in the Southwestern Pennsylvania area, including a group of 115 entrepreneurial women, and examined both demographic factors and attitudinal acceptance factors suggested by the Davis technology acceptance model and the Rogers diffusion of innovations theory. An analysis comparing the acceptance of Internet mentoring by entrepreneurial women and non-entrepreneurial women showed that entrepreneurial women were more likely to adopt Internet mentoring. This result has important implications with regard to the development and implementation of online mentoring programs for women entrepreneurs and non-entrepreneurs.